Aired on Wednesday, May 9th. On today's program, a chat with the bestselling Tulsa-based author and historian, Michael Wallis. Back in January, as part of the long-running Tulsa Town Hall Speaker Series, Wallis addressed a capacity crowd at the Chapman Music Hall in the Tulsa Performing Arts Center. His talk focused on what it means to be an Oklahoman --- on the character, history, lineage, goals, misdeeds, and accomplishments of the people of the Sooner State. It was a speech that drew much applause, rave reviews, and numerous tributes in the weeks that followed its delivery. 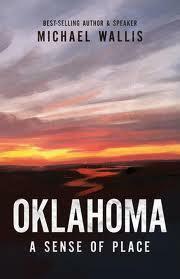 Now, Wallis has transcribed those widely praised remarks into this --- his latest --- book, "Oklahoma: A Sense of Place." Wallis, who actually moved to Oklahoma in the early 1980s, tells us about this book and the speech it grew out of. Also on today's show, our commentator Connie Cronley reflects on the life and times of her late friend and colleague, the ever-graceful Moscelyne Larkin, who co-founded what is now known as Tulsa Ballet in 1956. Larkin died last month at the age of 87. The life and work of Roman Jasinski, the late genius who created the Tulsa Ballet.